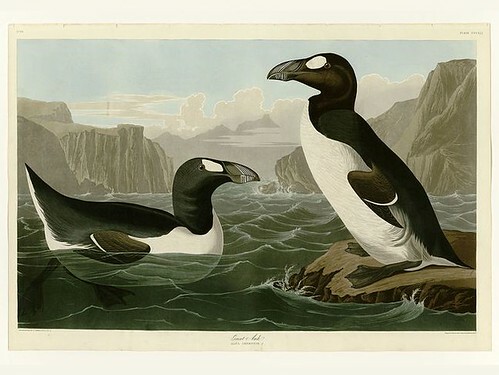 The Little Ice Age may have reduced the population of the Great Auk by exposing more of their breeding islands to predation by Polar Bears, but massive exploitation for their down drastically reduced the population. By the mid-16th century, the nesting colonies along the European side of the Atlantic were nearly all eliminated by humans killing this bird for its down, which was used to make pillows. In 1553, the auk received its first official protection, and in 1794 Great Britain banned the killing of this species for its feathers. In St. John’s, individuals violating a 1775 law banning hunting the Great Auk for its feathers or eggs were publicly flogged, though hunting for use as fishing bait was still permitted. It was on the islet of Stac an Armin, St Kilda, Scotland, in July 1844, that the last Great Auk seen in the British Isles was caught and killed. Three men from St Kilda caught a single “garefowl”, noticing its little wings and the large white spot on its head. They tied it up and kept it alive for three days, until a large storm arose. Believing that the auk was a witch and the cause of the storm, they then killed it by beating it with a stick. It is the only British bird made extinct in historic times. This entry was posted in Uncategorized and tagged 1844, 3 July, Great auk by admin. Bookmark the permalink.